Dan adopted six-month-old Sheldon and the bond was instant. Dan said that he wouldn't have made it through Christmas without Sheldon's companionship. “The results of this study will help demonstrate that the human-animal bond can facilitate healthy aging through providing companionship, a greater sense of purpose in life and emotional well-being,” said Steve Feldman, Executive Director of HABRI. Funded by a two-year grant from the Human-Animal Bond Research Institute (HABRI), faculty from the University of Georgia’s College of Public Health, College of Veterinary Medicine, College of Family and Consumer Science and the Obesity Initiative are collaborating on a new research project to examine the impact of pet companionship on mental and emotional health in older adults living alone. Partnering with the Athens Area Humane Society and UGA’s Campus Cats organization, a rescue group that works with homeless cats on campus, the team will match foster parents and felines. The team is led by Heidi Ewen and Sherry Sanderson, a veterinarian and associate professor at the College of Veterinary Medicine. 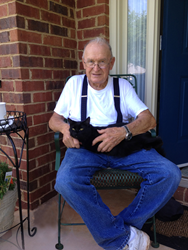 Beginning in October, the team will begin to identify older adults in the Athens Area that are willing to foster cats. The 34 pairs of cats and seniors will then be interviewed and assessed throughout the study to determine whether having a pet in the house leads to changes in their emotional well-being. Assessments include, loneliness, emotional well-being, and purpose of life scales as well as measures of attachment to, and comfort from, the foster cat. Findings are expected to demonstrate improvements in mental and behavioral health in foster parents including reduction in loneliness and depression, and that attachment to the companion animal will increase the duration of fostering or lead to adoption of the foster cat. The majority of people who live alone are 75 years or older and many of them tend to spend their days inside the home. For those who are single, it can be hard for them to maintain social connections outside of their home. Ewen knows many older adults living alone may struggle to find a reason to plan meals or engage in other daily activities without another person around to share them with. “But once they have a pet in the house, they have a reason to get up and to do things, a sense of purpose. They have something to care for who depends on them,” she said. “We believe that older adults who live alone will be ideal foster parents because they can give the cat love and a lot more individualized attention, than somebody who works and has to leave the house for nine hours a day,” said Ewen. Loneliness is one threat to public health that can often be addressed in relatively simple and inexpensive ways, says Kerstin Emerson, assistant professor of gerontology in the College of Public Health’s Institute of Gerontology and team member on this study. Emerson’s research on older adults has shown that loneliness is emerging as a serious threat to public health, with recent studies suggesting that loneliness poses a similar threat to our health as obesity and smoking. “If we can address loneliness, we can prevent associated negative outcomes, such as disability, cognitive decline, and depression. Our intervention has the possibility of decreasing loneliness and increasing quality of life among vulnerable older adults,” said Emerson. All the cats in the study will be spayed/neutered, screened for FeLV/FIV, vaccinated, dewormed, treated for fleas and microchipped before they go to their foster home. While the cats are in foster care the study will furnish all the supplies the foster parent needs, including food and cat litter, which is being donated by Nestlé Purina. Dr. Sanderson or a trained veterinary student will be checking on the cats monthly to see how they are doing, treat any minor health issues, and to bring food and litter. Diane Hartzell, program coordinator for UGA’s Obesity Initiative, will conduct interviews and assess results on an ongoing basis. The Human Animal Bond Research Institute (HABRI) is a not-for-profit organization that maintains the world’s largest online library of human-animal bond research and information; funds innovative research projects to scientifically document the health benefits of companion animals; and informs the public about human-animal bond research and the beneficial role of companion animals in society. For more information about HABRI, visit http://www.habri.org.